ACLoginWidget is a tiny plugin for WordPress that automatically makes a login form for your ActiveCollab installation in your WordPress Site, in any sidebar. The widget is multi-instance capable, so you can place the login form in any sidebar you would like. The plugin is now available at in the WordPress Plugin Directory as ACLoginWidget. Make sure in ActiveCollab, you have the Public Submit module installed and configured. If I’m already logged in, the plugin works, but AC gives me an ‘Already Logged In’ warning. That’s just the nature of the widget, unless it can actually tie into AC, it can’t know if you are already logged in. We hope to add some of this functionality in a future version. Display the RSS dashboard feed of users in ActiveCollab, if they are logged in and the cookie is accessible to the WordPress installation. 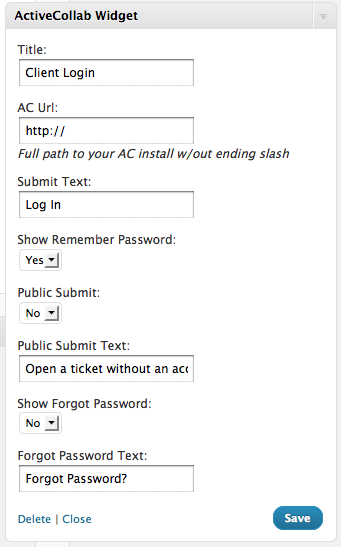 Users logged into wordpress can specify their ActiveCollab API key in their account to feed the widget data.